I can’t wait to get my Apple smartwatch. But since Apple has yet to announce such a thing — there is, I’m sure, an Apple watch in the works, somewhere, alongside an Apple television, an Apple car, and an Apple invisible airplane — I decided to take the bird-in-hand approach and buy myself a Pebble Steel smartwatch. The original Pebble’s 2012 Kickstarter campaign was the most successful to date, raising over $10 million after blowing through its $100,000 target within two hours. I first saw one on the wrist of a concierge at Apple’s Sydney store, and I was deeply impressed with its functionality and sheer geekiness. This year’s update, the Pebble Steel, persuaded me that a Pebble could be stylish as well as useful, and I ordered my watch in February 2014. (The basic Pebble models are colorful and a little plasticky looking — it’s not necessarily a bad look, but it’s not my look.) The company was clearly struggling to meet demand; my Pebble Steel arrived in late April. I’m mostly pleased. The first thing that struck me was the build quality — the Pebble Steel feels like a grown-up watch. It ships with two bands in the box — one leather and one made of stainless steel. But while the basic Pebble watch can be fastened to any standard 22mm watch band the Steel uses a proprietary screw-in strap connector for no apparent reason, restricting you to the two included bands. My Pebble Steel shipped with the leather band in place, and the result was a watch that felt lightweight and insubstantial, almost to the point of being flimsy. I immediately switched to the stainless steel band, which gave the watch the heft I desired. The case is, as you’d expect from the name, made of steel, with four large buttons — three on the right, and one on the left. The buttons feel inexpertly machined; one becomes accustomed to high build quality when one is a regular user of Apple devices. While there is nothing actually wrong with the edges of the buttons on the Pebble Steel, they feel slightly sharp, and one cannot help but think, albeit uncharitably, “Hmmm, Apple would have done that better.” Size-wise, the Pebble Steel is slightly thinner than my Citizen diving watch, and about as wide as my Seiko dress watch. But while I was pleased with the appearance, what really mattered was what it could do for me. The Pebble Steel is, it turns out, an effective smartwatch. After you have downloaded the free Pebble app to your iPhone, you pair the watch and the phone via Bluetooth — the pairing process is easy, with the iPhone quickly recognising the watch. Once that’s done, the Pebble is tethered to the iPhone, and any notifications that appear on the iPhone’s screen also appear on the Pebble’s. This also means that if a notification doesn’t appear on the iPhone’s screen, as might be the case if an email message arrives while the Mail app is open, then nothing happens on the watch either. I am finding this to be a wonderfully useful feature — as a teacher, I feel a little bad telling my students to put their phones away in class and then pulling mine out to read a message (I still do it; I just feel a touch hypocritical when I do). Now, when my iPhone buzzes in my pocket, my Pebble also buzzes on my wrist, and a quick, discreet glance shows me the source — Messages, Facebook, Twitter — and the sender of the notification, and, if there’s room remaining, the text of the message. Being able to keep an eye on what’s happening on my iPhone without having to whip out the phone itself is convenient, and might, if such watches become much more widespread, go some way toward addressing the habit that the younger set have developed, and that we curmudgeonly older types find somewhat annoying, of pulling out a phone and reading the screen in mid-conversation. That, to be fair, is most of what the Pebble watch does. A push of the button on the upper left of the phone dismisses the notification, and the screen returns to being a watch. There’s no way of replying to a Facebook message, or dismissing a text message from the lock screen of the iPhone, but at least I know, discreetly, when my watch vibrates, how urgent the message is. Unfortunately, you can’t set different vibration patterns for different apps — I still find myself relying on the custom vibrations on my iPhone to tell me if a notification is for a text message, or a phone call, or email. I understand that, with an Android phone and a little third-party software, a more two-way interaction is possible, but there are some things into which I’m simply unwilling to delve, even for TidBITS. The rest of the time, the Pebble Steel is a watch. Its grey “e-paper” screen is sharp and clear even in bright daylight (though polarized sunglasses can prove problematic). In low light, a flick of the wrist triggers the watch’s accelerometer, which lights up the screen for a few seconds. The resolution is high enough that the various watch faces that can be downloaded through the Pebble app are easily readable. I currently have an elegant classic analogue face on my watch, with a second hand, and day, date, month, and year displays; when I’m feeling a little pretentious, I select a Japanese display that shows the time in Kanji. Myriad faces are available, from the classy to the minimal, from the obvious (an Apple logo with a digital time display below it) to the cutesy (I do have a Mickey Mouse face on my watch, which I use infrequently), from the geeky (a Star Trek-themed LCARS-style face) to the deeply arcane (the time displayed in Circular Gallifreyan). Getting new watch faces onto the Pebble Steel is simple. The Pebble app displays screenshots of countless faces; tap one and you see the designer’s description and an option to add it to the watch. 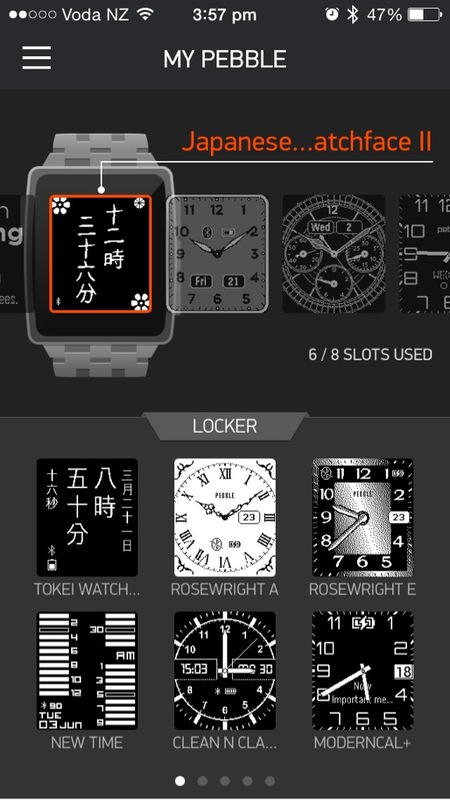 The watch can accept only up to eight watch faces at a time; once all your slots are full, additional faces are stored on the iPhone in what Pebble calls the watch’s “locker.” If you want to add a new one, you must free up space on the watch by removing one of the eight already installed. Once your watch is full of faces, you can switch through them using the up and down buttons on the right of the watch. 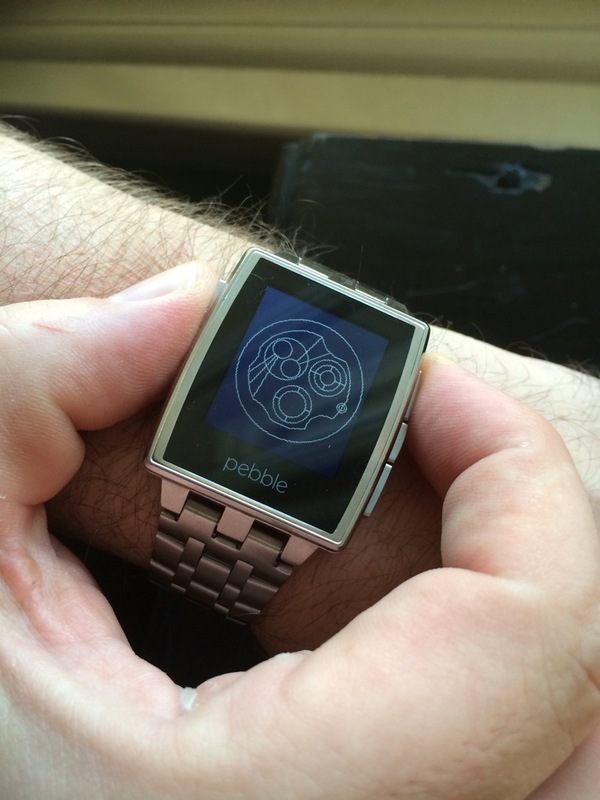 The Pebble app is also your conduit to finding watch apps, none of which have struck me as terribly useful so far. There are apps that claim to be heart monitors, but the watch’s accelerometer is simply not sensitive enough to detect a pulse; these apps tend to be just one-minute timers that require you to measure your pulse yourself. There are sleep-tracker apps, but they don’t store much information on the watch — you have to enter sleep data into a data-tracking app manually. There are GPS apps, but they tend to be turn-by-turn direction displays on the watch that end up looking more like a solution in search of a problem. There are some games, including a Tetris clone that’s impressively tiny, and unsurprisingly hard to play. And if your eyesight is really good, there’s even an xkcd app with select comics. For football fanatics like TidBITS’s Agen Schmitz (see “FunBITS: How to Watch the 2014 World Cup Online,” 13 June 2014), there’s a new World Cup 2014 app that promises real-time game scores. If there could be a greater flow of information back from the Pebble to the iPhone, apps could better interact with the phone, and developers might come up with more compelling applications, but for now, the only app I have on my watch is one that displays aeronautical weather for when I’m flying. Another limitation to the utility of watch apps is the lack of background processing. Pebble recently announced a partnership with Misfit to create a fitness-tracking app, but unless you have the app in the foreground, it won’t count your steps. In other words, you can have a watch on your wrist, or a pedometer, but not both at the same time. Since Pebble touts this new functionality as “just the first step towards seamless integration with Misfit and activity tracking on Pebble,” I’m hoping to see background processing — for other apps as well — included in future updates to the Pebble watch’s operating system. The only additional capability the watch offers is limited control over audio playing on the iPhone, in that you can start and stop the current song, skip it, or repeat it. But you can’t change playlists or even the volume. It’s a lovely idea, and could be useful for those who dock their iPhones in a speaker system for music, but it’s not a huge win. Ironically, the most useful app-like functionality I’ve found comes from the notifications provided by Google Maps. Walking around Auckland, if I tell the Google Maps app on my iPhone to give me directions to, say, Viaduct Harbour, then my Pebble gives me a quick buzz at every intersection and I can glance at my wrist to see which way to turn — no need to pull out my iPhone (and look like a tourist!) to find out where to go. The Pebble charges via a custom USB cable that attaches magnetically to contacts on the left side of the watch. When it’s plugged in, a small LED in the lower left corner glows red to indicate charging and green when the charge is complete. There is, so far, no other use for this LED, but there is talk that Pebble will open it up to developers in future editions of the Pebble SDK. A full charge takes about 5 hours; I tend to charge it overnight after it has alerted me with 20 percent and 10 percent warnings. Other users tell me a charge can last 5–7 days, but 3–4 days is more realistic in my usage; apparently the more processor-intensive a watch face is, the faster the battery will empty, with animations such as sweep-second hands being the biggest drain. So is the Pebble worth it? I’ve had my Pebble Steel on my arm for about a month or so now, and I’d miss it enormously if it were taken away. I’ve become quite reliant upon the subtle, discrete glance at the wrist to see what’s going on, and I would be sad to see it go. The basic Pebble (which offers exactly the same functionality) will set you back $150, while the Steel costs $249. The rumour mills are adamant that Apple is about to release an iWatch, so it’s tempting to hold off for such an undoubtedly wondrous device (unencumbered by reality as it is at the moment). But then, the very same rumour mills have also insisted that an Apple television would be in everyone’s living room by now. I was fortunate enough to have had a little discretionary cash from a couple of freelance projects, and treated myself to the Pebble Steel as a little thank you to myself. It’s not an essential piece of kit, but it is a fantastic geek toy. Good review. I love my pebble too, also while waiting for the iWatch! One slight correction, but the latest update to the pebble has volume control on their music app. Simply hold the play/pause buteo for a second and the next/prev buttons become up/down volume ones. Another toggle of the middle button and the next/prev buttons return. I agree, good review. 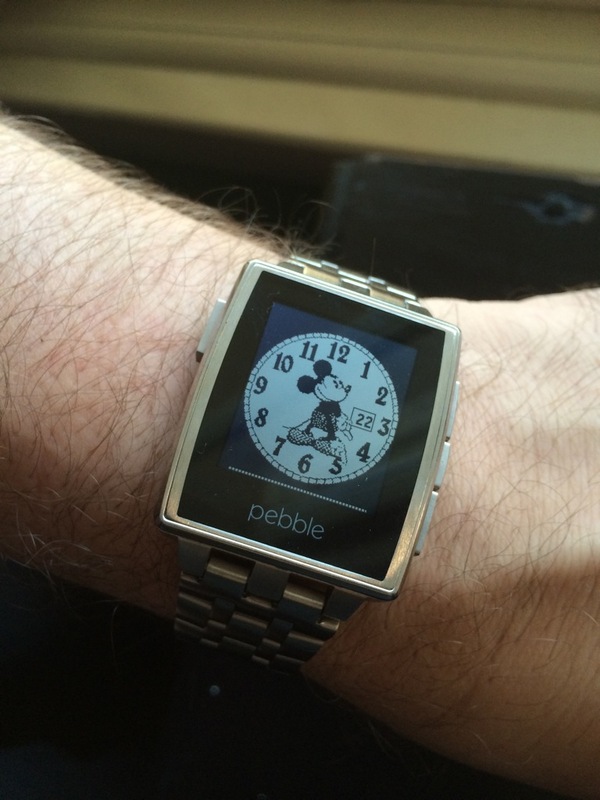 The Pebble should really be called Buzz. As a 'boomer' I find some of the watch faces unreadable. I replaced the black plastic band with a segmented, black metal band via eBay, $18 delivered from China. Yes, good call---the Buzz! It's great for that, plus I now finally am willing to put a watch (geeky though it may be) on my wrist. Agreed, too, on the main need: background apps, especially for fitness---and I hope it's not *just* Misfit.